COMMENTS:        This trigger occurred at longitude,latitude = 205.16,14.98 [deg]. COMMENTS:        NOTE: This BAT event is temporally(0.0<100sec) coincident with the FERMI_GBM event (trignum=495804623). COMMENTS:        NOTE: This GBM event is temporally(0.0<100sec) coincident with the SWIFT_BAT event (trignum=712505). COMMENTS:        This trigger occurred at longitude,latitude = 189.80,-22.57 [deg]. COMMENTS:        NOTE: This GBM event is temporally(2.0<100sec) coincident with the INTEGRAL_SPIACS event (trignum=7567). COMMENTS:       NOTE: This SPIACS event is temporally(2.0<100sec) coincident with the FERMI_GBM event (trignum=495804623). COMMENTS:        The XRT position is 0.29 arcmin from the BAT position. Dec(J2000) = +46d 23' 56"
with an uncertainty of 3 arcmin (radius, 90% containment, including systematic uncertainty). The BAT light curve shows several overlapping peaks with a total duration of about 25 sec. The peak count rate was ~2300 counts/sec (15-350 keV), at ~0 sec after the trigger. Dec(J2000) = +46d 24' 11.6"
with an uncertainty of 4.2 arcseconds (radius, 90% containment). This location is 16 arcseconds from the BAT onboard position, within the BAT error circle. This position may be improved as more data are received; the latest position is available at http://www.swift.ac.uk/sper. We cannot determine whether the source is fading at the present time. No spectrum from the promptly downlinked event data is yet available to determine the column density. The initial flux in the 2.5 s image was 7.72e-10 erg cm^-2 s^-1 (0.2-10 keV). UVOT took a finding chart exposure of 125 seconds with the White filter starting 99 seconds after the BAT trigger. No credible afterglow candidate has been found in the initial data products. The 2.7'x2.7' sub-image covers 100% of the XRT error circle. The typical 3-sigma upper limit has been about 19.6 mag. Results from the list of sources generated on-board are not available at this time. No correction has been made for the expected extinction corresponding to E(B-V) of 0.16. Dec (J2000): +46d 24' 13.2"
We observed the field of GRB 160917A (Racusin et al. ; GCN Circ. 19926) with the 1.5-m OSN telescope in Granada, Spain. We began observing at 19:08:34 UT (7.64 hours after the GRB onset), and obtained 14x300s images in I-band. In our coadded image, we find no new source in the refined XRT error circle (Evans et al; GCN Circ. 19927) down to a a 3-sigma limit of I(Vega) = 22.6. The calibration was performed using a nearby star in the USNO B1 catalog, and the upper limit corresponds to an isolated point source in our co-added image. We suggest the source as optical afterglow of GRB 160917A. We have analysed 6.2 ks of XRT data for GRB 160917A (Racusin et al. GCN Circ. 19926), from 80 s to 17.4 ks after the BAT trigger. The data comprise 43 s in Windowed Timing (WT) mode (the first 9 s were taken while Swift was slewing) with the remainder in Photon Counting (PC) mode. The enhanced XRT position for this burst was given by Evans et al. (GCN Circ. 19927). The light curve can be modelled with a power-law decay with a decay index of alpha=1.243 (+0.030, -0.029). A spectrum formed from the PC mode data can be fitted with an absorbed power-law with a photon spectral index of 1.81 (+0.22, -0.21). The best-fitting absorption column is 2.8 (+1.1, -0.9) x 10^21 cm^-2, in excess of the Galactic value of 1.7 x 10^21 cm^-2 (Willingale et al. 2013). The counts to observed (unabsorbed) 0.3-10 keV flux conversion factor deduced from this spectrum is 4.1 x 10^-11 (5.5 x 10^-11) erg cm^-2 count^-1. If the light curve continues to decay with a power-law decay index of 1.243, the count rate at T+24 hours will be 2.8 x 10^-3 count s^-1, corresponding to an observed (unabsorbed) 0.3-10 keV flux of 1.1 x 10^-13 (1.5 x 10^-13) erg cm^-2 s^-1. The results of the XRT-team automatic analysis are available at http://www.swift.ac.uk/xrt_products/00712505. with an estimated accuracy of 1.5 arcsec. The magnitudes in the table are not corrected for the Galactic extinction due to the reddening of E(B-V) = 0.16 in the direction of the burst (Schlegel et al. 1998). "At 11:30:19.286 UT on 17 September 2016, the Fermi Gamma-Ray Burst Monitor triggered and located GRB 160917A (trigger 495804623 / 160917479). which was also detected by the Swift/BAT =E2=80=8B =E2=80=8B (Racusin et al., GCN 19926). =E2=80=8B =E2=80=8B The GBM on-ground location is consistent with the Swift position. The GBM light curve consists of a single peak with a duration (T90) of about 47 s (50-300 keV). The time-averaged spectrum from T0 to T0+14.1 s is best fit by a power law function with an exponential high-energy cutoff. The power law index is -1.00 +/- 0.05 and the cutoff energy, parameterized as Epeak, is 1604 +/- 357 keV. The event fluence (10-1000 keV) in this time interval is (7.2 +/- 0.3)E-6 erg/cm^2. The 1-sec peak photon flux measured starting from T0 in the 10-1000 keV band is 5.1 +/- 0.2 ph/s/cm^2. 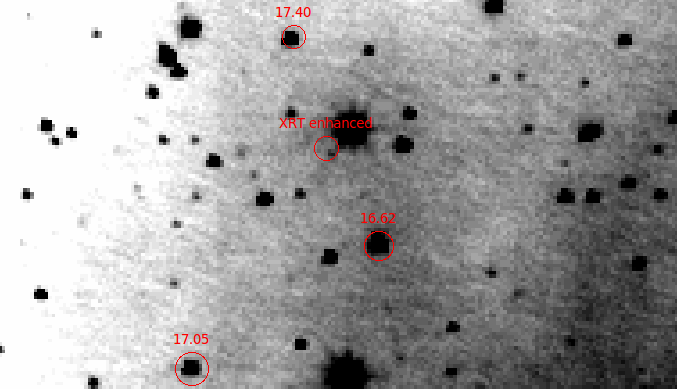 We observed the field of GRB 160917A (Racusin, et al., GCN 19926) with the Reionization and Transients Infrared Camera (RATIR; www.ratir.org) on the 1.5m Harold Johnson Telescope at the Observatorio Astron=F3mico Nacional on Sierra San Pedro M=E1rtir from 2016/09 18.12 to 2016/09 18.36 UTC (15.39 to 21.08 hours after the BAT trigger), obtaining a total of 3.72 hours exposure in the r and i bands and 1.63 hours exposure in the Z, Y, J, and H bands. Dec(J2000) = +46d 23' 59.3"
The mask-weighted light curve shows an initial bright peak about 1 second long with some structure on finer time scales, and variable emission for another 30 seconds. Another weak peak occurs from T+50 to T+90 seconds. T90 (15-350 keV) is 16 +- 2 sec (estimated error including systematics). The time-averaged spectrum from T-0.34 to T+15.31 sec is best fit by a simple power-law model. The power law index of the time-averaged spectrum is 0.89 +- 0.15. The fluence in the 15-150 keV band is 1.3 +- 0.1 x 10^-06 erg/cm2. The 1-sec peak photon flux measured from T-0.01 sec in the 15-150 keV band is 2.2 +- 0.3 ph/cm2/sec. All the quoted errors are at the 90% confidence level. Photometry is based on nearby USNO-B1.0 stars used in GCN circ. 19929. In comparison with our previous observation (Volnova et al. GCN 19929) the source is not visible up to 22.0 mag. The source faded between two epochs on at least 1.4 magnitudes and it is most probably the afterglow of GRB 160917A. Our observation is compatible with more deep RATIR observation in r-filter (Butler et al. GCN 19933). Analysis of Astrosat data showed the CZTI detection of GRB160917A (Swift BAT detection: S.Barthelmy et al., GCN Circ. 19926). The source was clearly detected in the 40-200 keV energy range. The light curve shows a single peak at 11:30:25.0 UT, 6 seconds after Swift Trigger at 11:30:19.0 UT. The peak count rate was 116.0 counts/sec above the background (four quadrants summed together), with a total of 1008.0 counts. The local mean background count rate was 327.0 counts/sec. Using cumulative rates, we measure a T90 of 21 sec. The AMI Large Array robotically triggered on the Swift alert for GRB 160917A (Racusin et al., GCN 19926) as part of the 4pisky program, and subsequent follow up observations were obtained up to 10 days post-burst. Our observations at 15 GHz on 2016 Sep 17.65, Sep 20.87, and Sep 24.87 (UT) do not reveal any radio source at the XRT location (Evans et al., GCN 19927), with 3sigma upper limits of 150 uJy, 84 uJy, and 90 uJy respectively. At 11:30:20 UT on 17 Sep 2016, the Lomonosov BDRG Gamma-ray Burst Monitor (http://lomonosov.sinp.msu.ru/en/scientific-equipment-2/bdrg ) triggered GRB 160917A (J. L. Racusin, GCN 19962). GRB 160917A has several peaks LC, total duration 25s, the energy range 70-1000 keV. More information will be available at: http://lomonosov.sinp.msu.ru/category/results/observation-gamma-ray-bursts This Notice was ground-generated. The message may be cited.